She bestrode the world of labour journalism like a colossus. For three decades, Funmi Komolafe’s professional career won her awards from the labour movement. However, the Zenith came recently when, in a ceremony to mark its 40th anniversary, the Nigeria Labour Congress (NLC) recognised Komolafe’s distinguished contributions to union activism. You have been recognised by the Nigerian Labour Congress alongside other people. What was the award for? 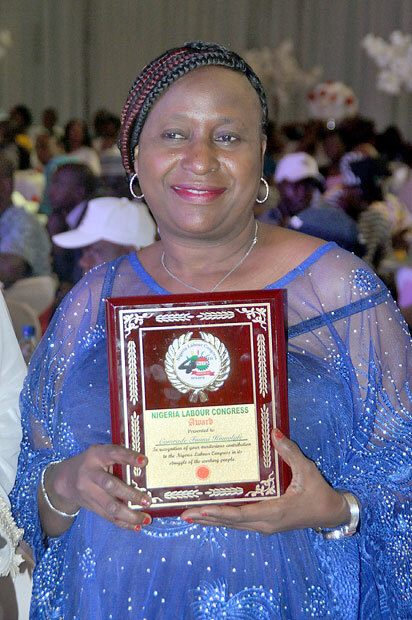 Funmi Komolafe: The award was in recognition of one’s contributions to the emancipation of workers’ rights, working women’s rights, child and maternal issues and general workplace issues. I was the only journalist that was given the award and this is the first time the NLC has ever given that kind of award to anyone. It was organised to mark the 40th anniversary of the NLC. It came as a surprise because if it had come to me when I was working full-time as a journalist, it may have been insinuated that I had been compromised. But it is coming after I left full-time practice. So, I find this very significant and very special. However, I must say that before this award, I had got many others, from Benue State NLC; Food and Beverages Senior Staff Association; PENGASSAN, etc. But this coming from the central labour organisation makes it very unique. An award was also given to Tunji Oyeleru posthumously. Oyeleru was Vanguard’s ace photo journalist who died in a road accident while on a labour assignment. Looking back, I want to acknowledge the fact that I worked in a place where one was allowed to work to the best of one’s ability. In other words, kudos also goes to my employers because I believe that this award came more as a reward for the work I did. This feat couldn’t have come cheap. What would you say were your peculiar challenges while on the job? Funmi Komolafe: There were so many challenges. I am sure you will remember that I was almost killed by irate workers in Lagos State during a strike. I give God the glory that I did not get the award posthumously. Journalism itself is quite challenging. It is not the best of job for women, but it is also a very interesting job. You must be committed to the profession; you must keep your integrity; that is very important. Let me say that while reporting, most of the time, sources want to use you to achieve their own objectives. As a journalist, you must be able to distinguish between fact and fiction; you must be able to save yourself from being used by people with selfish interests. Once you do that, you are able to keep your professional integrity. And it makes people respect you more. When you begin to ask for ‘brown envelope’ or gratification or anything from anybody, you lose respect from your sources and compromise your professional integrity. I give God all the glory because working and covering labour for 30 years, I never had a single libel case against me. Someone once took us to court for a story I wrote but the court asked, ‘What is the business of Vanguard in this case? Somebody issued a press statement and Vanguard published it. So, what’s the issue?’ And the case was struck out. I never went to court and I never caused the newspaper to be sued for libel. But it leads me to an important point, and it is important to journalism too. These days when I read some stories in newspapers, I ask myself, ‘Did these stories pass through a news editor? Did they pass through an editor?’ I think journalism should not be an all-comers’ affair. I believe that anyone who must practice journalism must go to a school of journalism even if only for one year. Because people don’t seem to appreciate the laws of libel, they think because you are a journalist, you can publish anything. No, it is not in all cases that you publish and be damned. You may be the damned if you don’t adhere to the rules of the profession. I also found out that a lot of people are ignorant. They don’t know where to draw the line between what is libellous and what is not. You can’t be in a hurry to make headlines. If you make headlines today and your paper is sued for N20m tomorrow for libel, what is the gain? Apart from your reputation being put on the line, you also put that of the paper. But I must say that covering labour was not easy, it was not a tea party affair. Labour is some kind of politics on its own. Different perspectives have split the labour movement ideological camps. You have to weigh the two sides to the story before taking a position; and you must take the position based on principle and not what benefits you as what benefits you as a person may not be in the interest of the people you are protecting or the employers. It was very tough as you have to work with colleagues in the newsroom. And some editors are very hostile to labour. But I think the case of Vanguard is special. Vanguard remains the top paper as far as labour reporting is concerned because I know that the publisher believes in a vibrant trade union. He believes that trade unions are among the pillars of democracy; otherwise you will have a government that would take people for a ride. If you remember the many strikes of Comrade Adams Oshiomhole: the anti-deregulation strike, the fuel price hike strike, these were not strikes based on wage issues but on economic issues; they were based on political decisions that had economic impact on workers and their families. So, covering labour gives one a wide perspective. But, again, you have to read the history of labour movement, apply it, take your time studying labour leaders, their ideologies, and when they go wrong, you will be able to say they are wrong. Let’s look at things from the female angle. Given your 30 years’ experience in labour reporting, how far will you say the Nigerian woman has gone in labour struggle? Funmi Komolafe: Oh, they have gone a long way. It could be better though. Nigeria is one of the countries that have ratified conventions to end discrimination at work. In other words, what is takes to be a man is what it takes to be a woman in Nigeria as long as you are doing the same job. We have also signed the Maternity Rights Convention which entitles the woman to go on maternity leave and still earn her pay. I remember the position labour took when First Bank decided to sack couples working for the bank. The bank had given couples working for it the option that one of them must resign. The organised labour took it up. I remember that I discussed with some of the then labour leaders: Who would be the victim? It is the woman because the man would say ‘let me go on, you stay at home’. But for the fact that the organised labour fought against it, First Bank would have gone ahead to do it. NLC rose against it to say that these are individuals who may have met in the bank and got married. ‘You may keep them at different branches, but not to say one must resign for the other. Considering the type of society we are, it is the woman that will be affected’. So far, I think we have done well. Nigeria is a respected member of the International Labour Organisation (ILO). We have ratified the Child’s Right Law, we are not in support of child labour and you can’t find anybody under 18 years employed in public institutions. Neither will you find such in private institutions. Nigeria has done well, but we can do better. A lot of people believe that labour unionism is dead or lost its poignancy with the exit of Comrade Oshiomhole. What is your take? Funmi Komolafe: I won’t say so, although I must admit that during Oshiomhole’s time, labour was very vibrant. But, again, it depends on the government of the day and the leadership. Different people have different styles. Some people prefer the military style. In this present administration, the strike embarked was not successful because it was a new government. However, sectorial strikes have been going on. They may not evolve into national strikes, but then discussion on the National Minimum Wage is on-going. So, we will see how it goes. If government behaves responsibly, then there will not be need for any strike. We need to explore other avenues before a national strike is declared. So, I insist that the union is not in sleeping mode but things could be better. Presently, there are no issues to necessitate a national strike. Maybe that is why we have relative peace. But unionism is not only about strikes. Apart from the National Minimum Wage, what else does the labour union do for Nigerian workers? Funmi Komolafe: Don’t forget that the primary responsibility is to union members and not to the general public. So they have their machinery. Workplace issues are being discussed. Recently, NLC put pressure on President Buhari not to sign the African Free Trade Agreement. And I support it wholeheartedly. I think what the president did is right. If the agreement was signed, more people are going to lose their jobs here and we will be creating jobs elsewhere. This is what happened when Structural Adjustment Programme (SAP) was introduced and our borders were thrown open and all sorts of imported goods came in and our factories died. We have never recovered from that. We are all patronizing goods from abroad, some of which are not necessarily better than ours. I think the problem is that the cost of production in Nigeria is very high compared to so many African countries because our companies cannot produce at optimal levels. I think labour acted very well to protest and the protest made the president to abandon the agreement. That is why I am surprised that the manufacturing industry is asking the president to review it when it is not in the interest of workers and business. We must put our house in order to protect jobs. For instance in China, foreigners are not allowed to open retail shops. If you open a retail shop, you must not be seen there. You must hire a Chinese who will be doing the business. There are some Nigerian restaurants there but the people serving the food are the Chinese. We have left our flanks too open. The post Irate workers nearly killed me during a strike — Funmi Komolafe appeared first on Vanguard News.